Institute for Excellence in Writing is well know in the homeschool community as well in traditional educational settings. IEW in continually providing more and more resources that go beyond writing. One of those products is Fix It! Grammar and we have been reviewing Fix It! Grammar Book 1 The Nose Tree Teacher’s Manual Book 1 and The Nose Tree Student Book 1 for the past several weeks. Fix It! Grammar is a program that has children put newly learned grammar skills to immediate use through finding errors and editing daily passages. As the child edits the passages, she then copies the grammatically correct passages into a notebook. The passages tell a story as the child progresses through the lessons. Sound simple? It is simple and effective! There are six different levels for Fix It! Grammar. The levels naturally progress in difficulty as your student works through them. The various levels can be used for grades 3-12 depending on how much exposure and experience your student has had with grammar. Not sure where to place your student? IEW not only provides a webinar to explain how Fix It! Grammar works but a Placement Test is available as well. If you still have questions, IEW has an extremely helpful customer service staff. A Student Book is needed as well. There are two different options for the student text. You can purchase a spiral bound student workbook from IEW that includes the weekly lessons, Grammar Review Cards, and the Fix It! Grammar Glossary. The other option for the student text is to download it from IEW at no additional charge. Inside your teacher’s book, there are directions to download the student e-book. You are granted permission to download and print as needed for use within your immediate family or classroom. How Does Fix It! Grammar Work? Each level of Fix It! Grammar incorporates a classic story for your student to apply what she learns as she edits. In Book 1 The Nose Tree, the lessons are laid out in an easy to use manner. Each week contains a Learn It section where new information is introduced. In Week 1 the Learn It section covers nouns, homophones and end marks. Other weeks will cover topics such as: action verbs, indentation, adjectives, etc. After you cover the Learn It section, there are 4 daily passages. Each day your student will read the sentence and look up the vocabulary word (each passage has a bolded word that is the vocabulary word). On Day 1 work through the first passage with the student to make sure she understands the new grammar information. Days 2 – 4, the student will read through the sentence independently and mark edits. After your child has edited the passages, you go over them together. On Day 5, the student rewrites the passages correctly. Rewriting the passages correctly helps to reinforce the topics covered. The Fix It! Grammar Review Cards are a helpful addition. These cards are organized according to week and provide quick and easy review. You simple cut them out and keep them handy for quick review. Lessons are not overwhelming or time consuming. Lesson should not take more than fifteen minutes to complete. This is a great grammar resource for Charlotte Mason homeschoolers: short lessons, copy work, and utilizes literature. Initially when beginning The Nose Tree, I intended to use it with all of my children during our group learning time each day. After receiving the books, I decided to use Book 1 with just two of my students since my older children were beyond this material. However, my older students are at the table while we go over each day’s passage and they jump in if my two Fix It! students get stumped. It serves as an easy way to review the basic with these older students, instruct my two students actually using the program, and allow my younger ones to be informally introduced to grammar terms. My two students who are using The Nose Tree are 11 and almost 9. Each week we discuss the Learn It section and do the day 1 passage together. The rest of the week they work independently on the passages. Generally on Wednesday and Friday, I write the passages on the dry erase board and we work through them together. We also go over vocabulary words on these two days as well. For this review, I was sent one copy of The Nose Tree Student text. Since I was using this for multiple students, I followed the instructions for downloading a copy. When printing the Grammar Review Cards section of the book, I used cardstock paper for durability. I simply hole punched the review cards and placed them on book rings. The girls keep them in their three ring binders for easy access. Several years ago I purchased the older version of Fix It! Grammar and used it with two of my older students. The textbook method was not working well for us and I wanted a resource that would not be a burden but would be effective. At that time Fix It! Grammar had several levels contained in one text. I found the organization tricky but it was a great program. I was thrilled to see that Fix It! Grammar had been updated and couldn’t wait to try it. IEW has done a great job making a wonderful resource even better! The organization and instructions are easier to navigate. Well done, IEW, well done! We will definitely be continuing through the levels of Fix It! Grammar. The ability to download the student text makes this affordable for our large family. 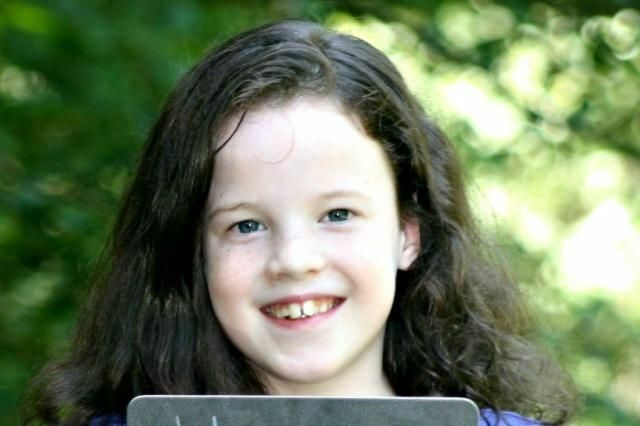 An affordable grammar program that my children love and is fun? Perfect! Fix It! 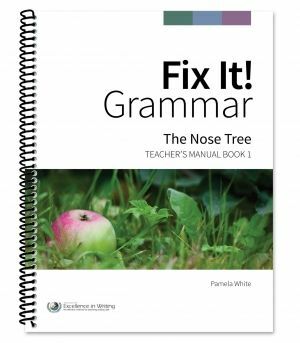 Grammar: The Nose Tree Teacher’s Manual Book 1 is $19.00. Fix It! Grammar: The Nose Tree Student Book 1 is $15.00 (or downloaded to print at no additional charge). You can also purchase the Fix It Grammar: Complete Package (Teacher’s Manual for all six levels) for $89. *Samples for each level are available. Fix It! Grammar gets two thumbs up from the Tribe! Don’t take our word for it. Other Crew members have been using The Nose Tree and other levels of Fix It! Grammar. Take a moment and see how they used Fix It! Grammar in their homeschool. 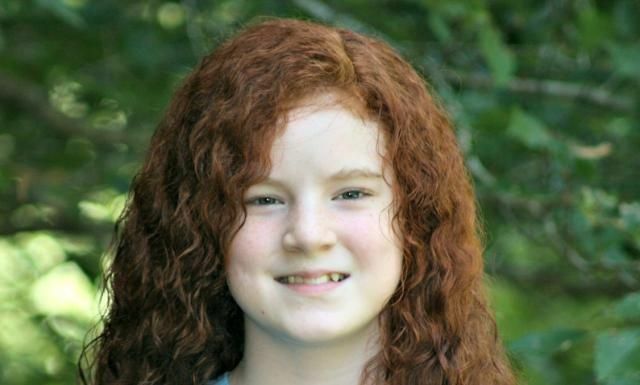 This entry was posted in Homeschool, The School Table, TOS Crew Reviews and tagged curriculum, grammar, Homeschool, review by sweetie. Bookmark the permalink. I see that you have reviewed both Analytical Grammar and Fix It! Both are good reviews but do you prefer one over the other? I really like both programs and am still using both of them. But with different children. I think it depends on your child and which is a better fit. My 11year old daughter is using Fix It and loves it. She likes how as she makes “edits” each day that she is putting together a story. It suits her very well and she is learning. My 13 year old son is using Analytical. He needed the straight forward approach. Here is the info and do a few sheets to show you got it and move on. Simple and to the point. He used Fix It for a while but said that he felt like he wasn’t learning anything. The presentation just didn’t suit him. My daughter would hate Analytical, lol. Love the flexibility of finding the perfect program for each kiddo.